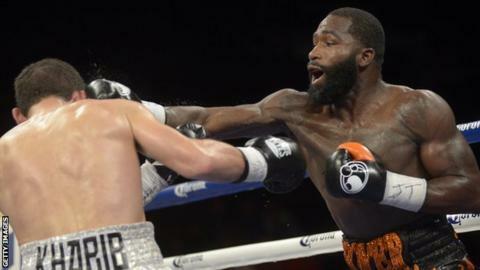 American Adrien Broner won a world title in a fourth weight division when he stopped Khabib Allakhverdiev to win the WBA light-welterweight belt. The 26-year-old, fighting in front of his home crowd in Cincinnati, halted the former champion in the 12th round. Broner was pounding the Russian, fighting for the first time for 18 months, with combinations when the bout was stopped with 37 seconds left. Victory improves his overall record to 31-2 with 23 knockouts. Broner has previously won world titles at super-featherweight, lightweight and welterweight. In Carson, California, Ukraine's Viktor Postol upset Argentina's Lucas Martin Matthysse with a 10th-round knockout to win the WBC light-welterweight crown. Also in Cincinnati, Puerto Rico's Jose Pedraza beat American Edner Cherry on a split decision to retain the IBF super-featherweight title.